Redesigning Education: Why Can’t We Be in Kindergarten for Life? I remember when my twins entered kindergarten at our community public school. All of the parents were invited to the school for an introductory presentation on the teachers’ goals for learning in the upcoming year. Everything sounded wonderful. The 25 children in the classroom would be organized into small groups. Creating art would introduce them to science and math concepts. They would be exposed to different cultures by learning songs in different languages. Time would be allotted for daily storytelling followed by discussion. The teachers described an interdisciplinary, imaginative and stimulating year ahead, complete with field trips and physical, active play. While listening to the teachers’ presentation at my twins’ school, I had a moment of clarity: The kindergarten classroom is the design studio. All of the learning activities that take place inside the kindergarten classroom are freakishly similar to the everyday environment of my design studio in the “real world.” In an architectural design studio, we work as an interdisciplinary global team to solve the complex problems of the built environment in a variety of different cultural contexts. We do this most effectively through storytelling–sharing personal experiences–with the support of digital media and tools. A variety of activities–reflective and collaborative, right-brain and left-brain–happen simultaneously in an open environment. Like the design studio, the kindergarten environment places human interaction above all else. Even the kindergarten classroom’s physical environment supports dynamic teaching and learning. It is zoned for multiple activities and agile enough for a variety of learning modes to happen simultaneously–one group of children could be working on an art project while another group is discussing a story in a stepped carpeted area with soft seating. In a kindergarten classroom, while there are walls with white boards or smart boards, the “front” of the room is indistinguishable. Every available wall and surface is an opportunity to display student work. The design allows students to explore many different ways of learning in the classroom–it’s learner-centered space. The learner-centered paradigm should extend beyond the kindergarten classroom. Unfortunately, most educational institutions follow a model that creates an impersonal environment where adults, teaching, and authority are at the center. 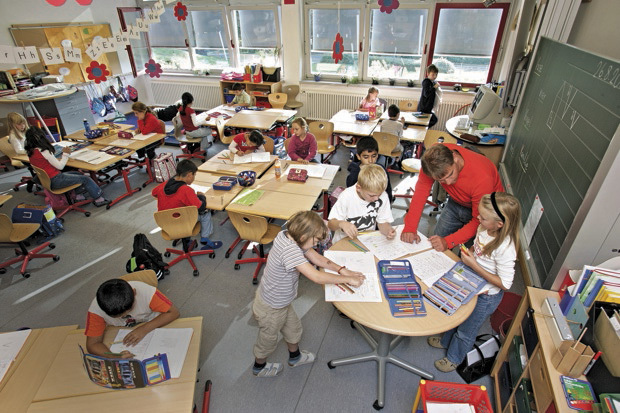 The studio-like environment of the kindergarten classroom succumbs to a rigid structure of disconnected subject-based classrooms and curricula. Naturally, the physical environment parallels this transition, moving from an open, multi-zone learning environment to a prototypical, teacher-centric mode of direct instruction. The collaborative student-teacher team and its dynamic atmosphere are replaced with the “sage-on-the-stage,” front-teaching wall model. Take classrooms from elementary through high school. It’s been near-universal since the 1800s to see self-contained classrooms that require teachers to instruct from front-teaching walls and students to sit in fixed chairs and desks in neat rows. Today’s global demand for creativity and innovation cries out for a new model for the learning environment. Great alternatives to this outdated spatial arrangement are entirely possible. For example, at the Henry Ford Academy: School for Creative Studies in Detroit, Michigan, self-contained classrooms are replaced with clustered learning spaces. The relationship of the spaces is designed to accommodate multiple modes of teaching and learning—for instance, a pair of classrooms flow out to a shared collaborative environment modeled after the design studio. Thanks to architecture designed by Albert Kahn Associates with Luce et Studio responsible for the interiors, this spacious shared area is furnished with agile, soft furniture to encourage group collaboration and reflective learning. In this interview, Mitchell Resnick from MIT characterizes the Lifelong Kindergarten Lab in the new Media Lab building.The new home of the MIT Media Lab designed by Fumihiko Maki is an exponential scaling up of the kindergarten classroom. Individuals from a wide range of disciplines collaborate to develop new products and processes to solve complex problems and enhance the human condition. The MIT Media Lab is research- and action-oriented–the result is not a whitepaper or a publication but a prototype of the solution. The space’s transparency reinforces human connection and collaboration. Floor openings and a central atrium also allow for visual connectivity vertically among the multi-story building. The Lab exemplifies the kindergarten environment in its celebration of group work. Many schools and work environments are embracing the reality that we live in multidisciplinary global world. The challenges and opportunities that we face in the 21st century require creativity, innovation and a deeper understanding of the complexities of the global economy, politics and culture. The kindergarten classroom fosters an environment where these values can be introduced and then thrive. Let’s make the kindergarten studio the new paradigm for learning environment—a natural extension of our innate human capacity to create and learn by doing.